BCT's manufacturing facility is located on 5 acres in Beaufort, NC and has been at this location for the past 20 years. The plant's elevation is 12 ft. above sea level, providing the ability to achieve maximum vacuum pressure when processing prepreg laminations. 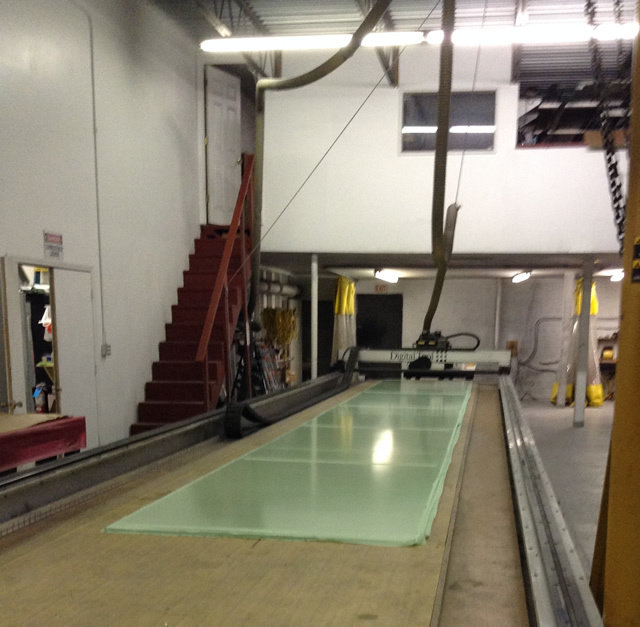 The plant is climate controlled on the material prep and lamination side, as well as the machining and painting areas. 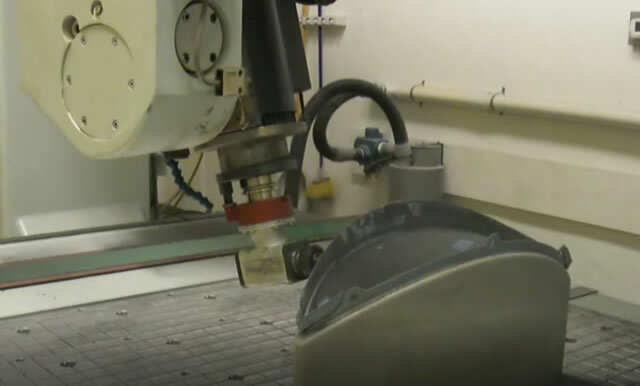 The 5-axis machining room is kept +/- 2 degrees F, when machining reflector surfaces or precision tooling. Though not a large plant (12,000 sqft), it is extremely well equipped for its size. The 3-Axis router is unique in that it is 42 feet in length, ideal for the machining of large panels into customer specified parts and for the machining of core. It is used for the machining of masters and molds, part trimming and for the machining of 3D structural foam. Heavy Duty stationary bridge machine with a single zone vacuum plenum per table. Twin tables may operate independently for load/unload on one table while the other is in process, or together as one large work area. Optodyne Doppler linear laser for persistent volumetric recalibration. CNC machining is an intragral part of BCT's capability. 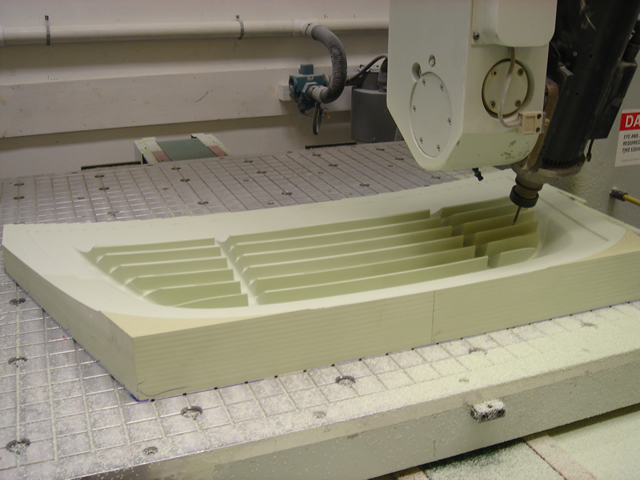 BCT has both a very long 3-axis router and a heavy duty 5-axis router. It also is equipped with all large and small power tools, as well as air tools. BCT designs and builds its own large, heated vacuum presses. 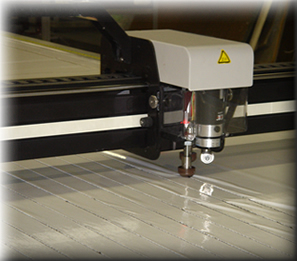 Their overall capability is large enough to produce one piece panels or sheets in sizes up to 4' by 32' and 4" thick. Heat is supplied to six independently controlled zones on both the top and bottom plates. 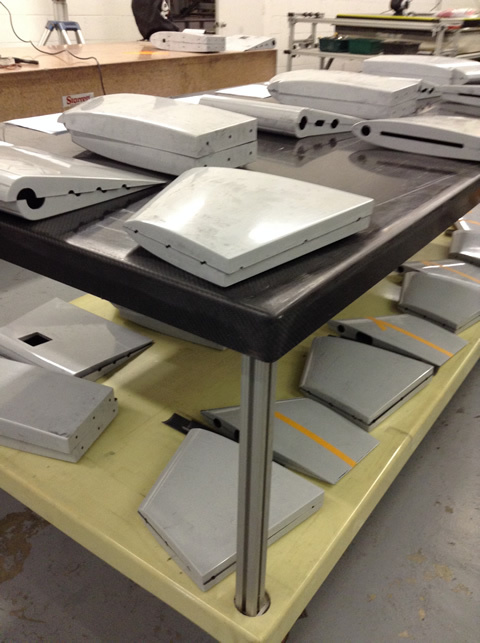 Each platen has two adjustable 240V multiplexed power supplies, creating temperatures as high as 325F and they are computer controlled using BCT's heated mold technology. The top and bottom platens are sealed with a quick sealing reusable silicone boot. 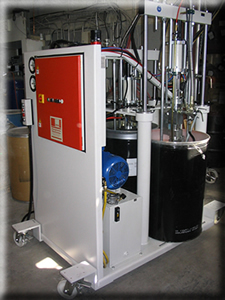 Clamping pressure is supplied by a high volume, 28" HG, computer controlled, integral vacuum pump. 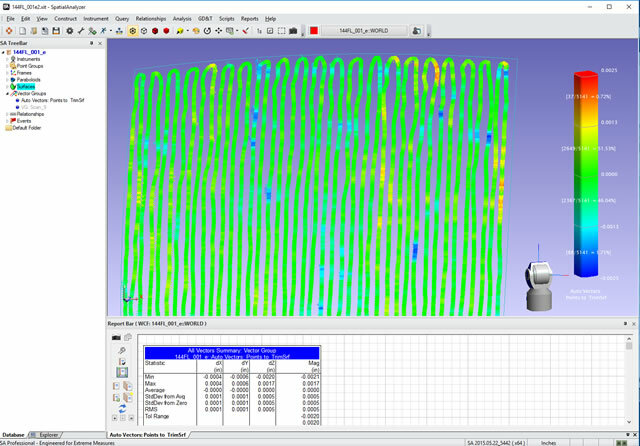 A forced air cool down is also computer controlled, minimizing any potential for panel warping. The press also has a carriage system that runs its entire length for even and precise stacking of plys to ensure consistent panels and sheets. All cures have their thermocouple data written to file. 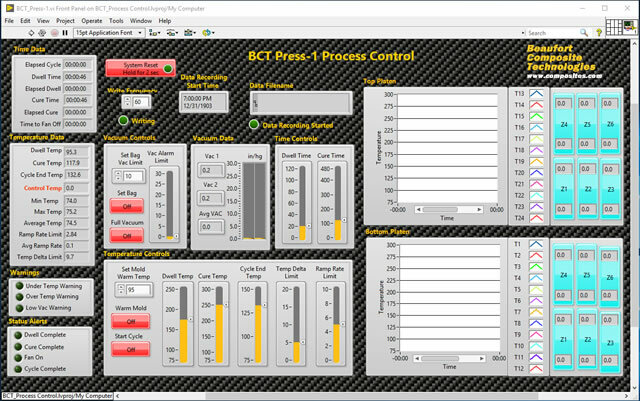 BCT has a Wisconsin oven with custom controls and control software. The Eurotherm control has been ugraded with a mini8 so it has 10 themocouple inputs and control software is used where the part temperature, not the oven temperature, is driving the process. BCT utilizes a DCS 2500 Static Gerber Cutter to maximize material yield of pre-preg and minimize material preparation labor hours. The split table operation allows versatility in the cutting floor, by having different materials cut one after the other. This machine offers reliability, accuracy, and consistent cutting of material, allowing for precise lay up, resulting in better molded parts. BCT has designed and built its variable power thermoformer utilizing high power IR heaters. This is used in thermoforming structural foam cores. Thermoformed core has the advantage over using scored core for developable and complex shaped parts because the scores draw off resin from the laminate, requiring additional film adhesive thickness, creating a heavier part. A PolyTool made by German builder 2KM is used for metering, mixing, and applying highly viscous tooling paste. Tooling paste is used in the master-making process. BCT over mills foam block, and then applies the tooling paste. When the paste cures, it is poscured for 24 hours and then milled into the final shape of the master or one-off mold. This process forms a strong, uniform thickness, shell minimizing any movement of the master which creates more accurate molds, enabling better parts. The MVP Patriot silicone machine is used primarily to manufacture re-usable vacuum bags. BCT however has developed processes to use silicone as a coating for specific purposes on machined structural foam. Most part painting is done in BCT's UL approved 16' x 22' x 8' spray booth. Larger parts are tented. BCT has numerous Binks spray guns; 95G gravity feds, 95 pressure pot and touch up guns. It also has other specific purpose spray guns and equipment. BCT sprays epoxy and polyurethane primers and topcoats, often custom matched. Reflector surfaces are sparyed with a mix of silver paste and butyl acetate to create a high conductive and RF reflective surface. Thickness verification is done using a DeFelsko Ultrasonoic Thickness Gage. BCT is extremely well equipped with equipment not often found in shops of its size. In fact, some of BCT's equipment is unique because it was designed and constructed in-house. BCT uses it's Faro Quantum Tracking Laser for precision fairing of masters, molds and parts. 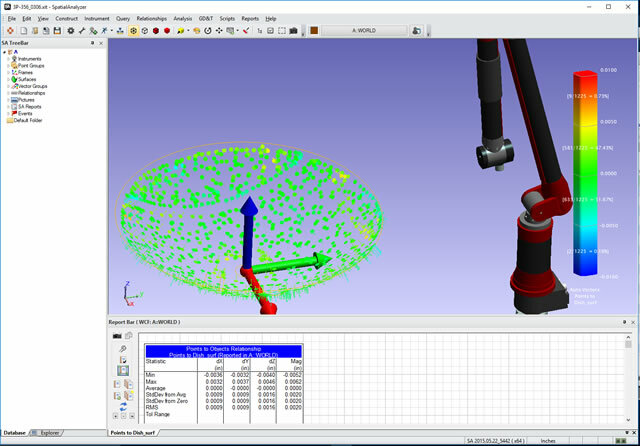 A retro probe is used for precise hole alignments. 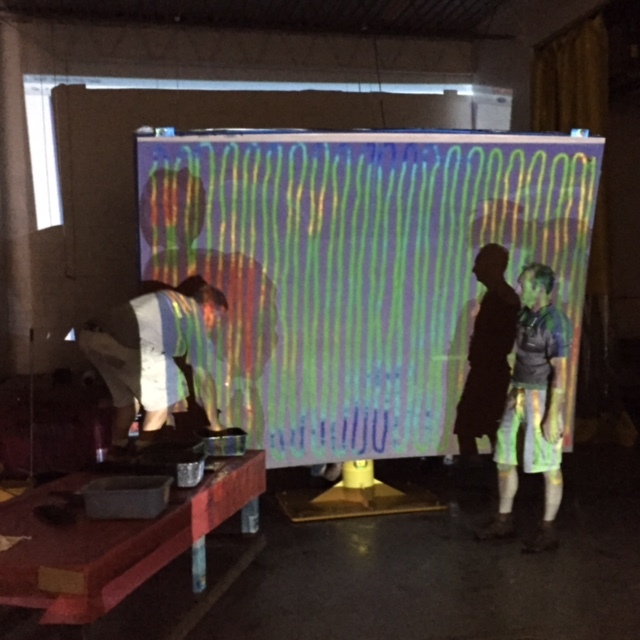 Over the years, BCT has developed its own techniques, like reprojection of scan data back onto the part being scanned. It is interfaced to Spatial Analyzer for its data retrieval and analysis. BCT's Romer scanning arm is used primarily on smaller reflectors for final fairing verification and for the scanning of finished parts. BCT uses it Optodyne Doppler linear laser for machine volumetric calibration. The pitch tables in its Fanuc controller have been expanded to its maximum capacity, so as to create finer pitch calibration points. This provides for a more accurate machine. A FLIR IR camera is used when verifying heater zones when BCT is building a heated tool. Very accurate, large granite surface plates are an invaluable resource. Starrett - 48' x 144" x 12"
Precision Granite - 66" x 132" x 8"
Having the ability to precisely measure surfaces is an essential part of BCT's equipment inventory. BCT has both a tracking laser with accessories and a scanning arm, as well as other testing and measuring equipment.